antiracismdsa: Defeat the Trump Fear Campaign- Vote ! Contrary to the current Trump Administration statements, we are not being invaded by people from Central America. President Trump has called the upcoming midterms an “election of the caravan”in reference to migrant caravan group of Central Americans currently walking towards the U.S.-Mexico border. Referring to the caravan as “an assault to [the U.S.],” Trump is extending his racist rhetoric he used against Mexicans—calling them “rapists” and “criminals”—to migrants from Honduras, Guatemala, and El Salvador. This fear campaign being mounted by the Administration is an attempt to win the November Congressional electionat the cost of once again promoting racially exploitive politics. The caravan of poor people, mostly Hondurans, heading toward the border should not be stopped. The Trump administration now threatens to deny refugee status to all of the migrants. That would be a violation of our treaty obligations as required by the Convention Relating to the Status of Migrants a United Nations Multilateral Treaty (1951) and the Universal Declaration of Human Rights (1946), which the U.S. government helped to draft. Many migrants are seeking asylum because the communities from which they are fleeing are taken over by violence. The U.S. has laws that allow suchrefugees to seek asylum and we have a due process system for determining who is eligible. International trade, trade agreements such as Central American Free Trade Agreement (CAFTA), the global drug trade, and increasing violence has led to thousands of people in Honduras and Guatemala to flee their homes in a caravan searching for a safer place, where families could have their basic needs such as food met. Rather than recognizing the violence that migrants are facing, Trump is suggesting that they are instead coming here to inflict violence by selling drugs or commit crime. This campaign extends again the fears of migrants he used to win the election in 2016. As long as the super rich in Central America and the U.S. can spend 7 million for a luxury yacht and 15-20 million for each of several homes while millions of people do not have enough money to feed their children nor to provide clean water or medical care, there will be conflict. At one time, this was the U.S. military intervening in civil wars in El Salvador and Nicaragua in the 1980s; Guatemala in 1954; or supporting coups in Honduras in 2009. 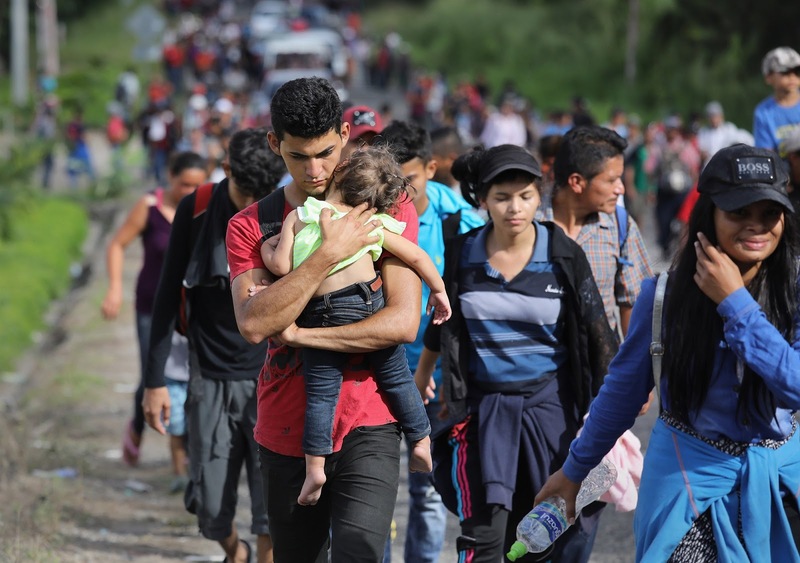 Now, the conflict is 7,000 people walking to the U.S. border to seek food and safety for their families. As NY Times columnist Nicholas Kristoff wrote, while the Trump campaign tries to raise the fear that we are being invaded, during the same time 16,800 Americans will die from drug abuse, 690,000 will become homeless, including 267,000 children, 8,850 will die from gunshot wounds, and another 9,000 will die from lack of health insurance. But, Trump and his enablers are worried about the possible migration of 1,000 refugees. Within the past year under Donald Trump, the U.S. has admitted only 22,491 refugees—one of the lowest numbers on record. The admissions count for the 2018 fiscal year, which ended on September 30, was less than half the number of refugees admitted in FY 2017 (53,716) and about one-quarter of the number of people admitted in FY 2016 (84,994). Trump has arbitrarily reversed the U.S. traditional position of welcoming refugees. Rather than joining in this fear campaign, we need to defeat Trump and his enablers. We need to vote. The Trump fear campaign could cost the Democrats several seats in the very close Congressional election on Nov. 6. What we can do is work twice as hard to defeat the Trump/Republican anti -immigrant agenda. Jessica Morse in District 4 and Josh Harder in District 10. In other districts, vote for the person who opposes the Trump agenda. In the end, we need an immigration policy that brings people together instead of tearing families apart. We need an immigration policy that benefits both migrants and refugeeshere as well as in their home communities and also benefits working people here in the U.S. For that, we need a national policy that limits U.S. military and economic interventions in other parts of the world in support of repressive regimes. To achieve these ends we need a new Congress that recognizes the human rights of migrants and the urgency of anti-imperialist foreign policy. Trump Seeks to Take Away Citizenship - Vote ! Trump Proposes More Family Separations ! Native Children separated from their families.